Electrochemical corrosion protection of underground cistern is determined by the fact that protected steel is not a subject to passivization, i.e., the surface doesn’t turn to negative condition where the surface coatings, which prevent corrosion, are created. The first person who described the protection of metals was Sir Humphry Davy, English physicist, chemist and geo-scientist; he was one of electrochemistry founders. The Davy’s theory was examined in 1824 on HMS Samarang, British Royal Navy ship: anode protectors installed on copper ship plating reduced corrosion speed. The following development of this method made cathode corrosion protection of metal constructions more efficient and used. 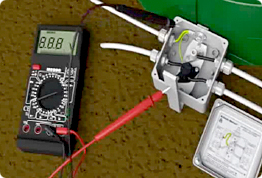 After the gas tank is mounted, there should be inspected the working capacity of electrochemical protection: the tension (difference of electric potential) on the electrode should vary inside the limits of 0.9 … -1.5V; current strength passed by sacrificial anode should not exceed 10мА. If the parameters differ from specified values, another test should be carried out in six months. Tension and current strength disappearance in the future means that protection life-time is over. To replace it there will be required to dismount the cistern; professionals from GC «Terrikom» will help you here. 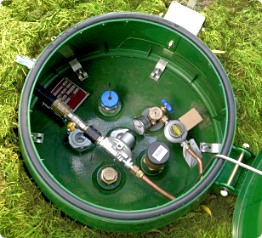 So, electrochemical corrosion protection protects gas tank from different types of corrosion as well as from the harm caused by underground vagabond and induced currents (parasitic currents). Three-component assistant connected and activated in the workshops of Italian Corporate «Antonio Merloni» increases the life-time of gas cistern. It’s reasonable to note that protection by the system of sacrificial anodes is applied together with special protective finish placed on «Antonio Merloni» cisterns: three coats of «Carboline» epoxy paint which has high corrosion resistance. Active and passive protections work together: even if protective coating has any defects, electrochemical corrosion protection will cope with corrosion in sensitive areas. Functional state of the protection all the year is maintained by protective bag «Marsupio», solid electrically conducting polymer.